Our premium quality Grade A Whole Ducks offer you a rare combination: a delicious, nutritious alternative to beef or chicken that stands up to any seasoning or flavor profile. Our White Pekin ducks are raised on family-owned farms where their diet consists of an all-natural blend of corn, soy and wheat that we produce in our own feed mills. All-natural USDA Grade A whole duck. 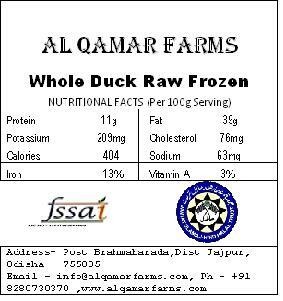 All Natural Duck contains no artificial ingredients and is minimally processed. Raised and cared for according to the strictest well-being guidelines. If frozen, thaw out in refrigerator. Remove from bag. Remove neck and giblets from body cavity. Rinse duck under cool water. Roast uncovered, breast side up, on rack in roasting pan 30 minutes per pound or until internal temperature reaches 180 degrees F (82 degrees C), measured at the thigh joint. The legs move freely and juices run clear when duck is done.